Chris Cleave posed this question at the inaugural National Writers Forum in Auckland this year. Pertinent, unsettling and almost prescient, it reminds me that 2016 has been a year like no other. The axis of the world has veritably tilted and despite being a semi-colon at the bottom of the world, New Zealand is affected. Brexit. Trump. Deaths of Leonard Cohen, David Bowie and Prince to name only a few. Don’t forget Alan Rickman aka Snape. Terrorist attacks. Refugee movements. New governments. Reshuffles. Sidesteps. Entries. Exits. If anything consistent can be identified, it’s that 2016 has been dog-eared by change, quite literally on every page. The arts are not separate from the rest of the world. In fact, the arts are the world. Right here in Aotearoa we too are experiencing adjustment: flutters of impatience, desire for transformation, determination to alter the status quo, and once again, we turn to the arts for a peek into a universe that is nearby. As a writer for The Big Idea, as well as other organisations, I have been very fortunate to witness a number of works both at home and overseas this year. Reflecting back on my conversations with artists and practitioners there is a sense that right here, right now; the temperature has started to rise. Not just because its summer but because there is a heat, a growing fever. It is making people question, challenge, criticise and problematize the ways things used to be, and that is excellent. In 2016 the words of Chris Cleave, Iosefa Enari and Han Areum stood out for me. Responding to the politics of the world as much as their craft (literature, dance and theatre) these artists captured the impressions of the world as they experienced it, one moment at a time. In turn, I offer my memory of these moments to you. Chris Cleave presented George Orwell to his audience but it’s not Orwell himself that gave me cause for memory. “Our slow and patient craft has undergone a sudden and startling temporal acceleration,” he says and suddenly, we are gathered to witness the striking of the clocks: a gathering created outside the world of email exchanges and solitary writing, a space for a festival for writers was born. Here all sorts of writery beings gathered in the same space to learn, share, debate and celebrate – and that is incredible. Not because individuals congratulated themselves on making it to the table but the fact that there was a chair to pull up. In a similar vein Pacific Dance took a massive leap this year too. 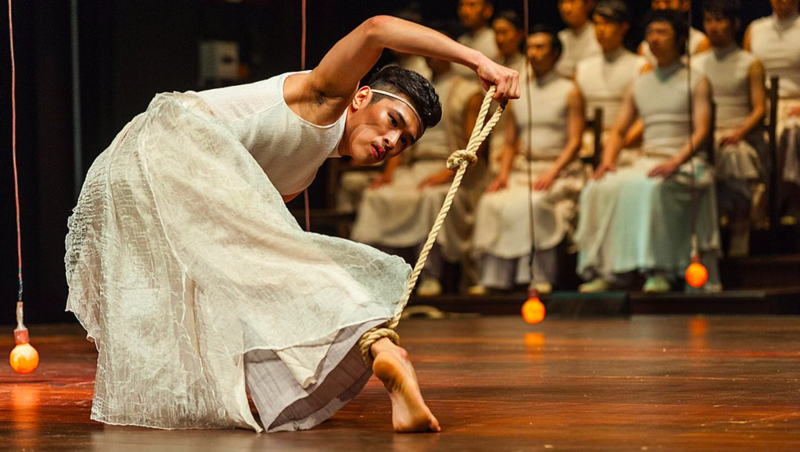 In 2016 we saw the first Pacific Dance Festival focusing on contemporary dance works and adding valuable breadth and depth to the showcase of what is known as Pacific dance. “We often think of Pasifika as just revolving round Polynesia but we forget we have 8 million Papua New Guineas in our backyard – that’s also changing the way we make our work,” says Artistic Director, Iosefa Enari. Taking a far more inclusive approach his dance festival displayed a degree of risk-taking that we are often reticent to applaud, let alone encourage, especially when it comes to creating opportunities for dynamic young voices to test their ideas. Reflecting upon time and space and the various intersections in which we find ourselves caught is absolutely necessary. But it would be remiss not to allow a tiny indulgence: examining the nature of the individual in the heady rush of a swirling world. Our relationship with our self essentially determines our relationship with everyone else and this nugget of self-revelation (which whacked me unremorsefully on the head multiple times this year) was illustrated with devastating charm in Han Areum’s rendition of The Chorus; Oedipus. How fitting that such a thoughtful and thought-provoking comment should start the year. It has been a long twelve months and a sequence of events have seen human dignity quartered and mulched; the rise of neo-liberalism from within and the corrosive effect of racism. Looking back, both at the consummate world of art and the tumultuous world it reflects, it is appropriate to say that the world, has indeed tilted on its axis. Rich and bright, but equally troubled and fraught. Such is the nature of deliberate juxtaposition. The only question remains: what will 2017 bring?